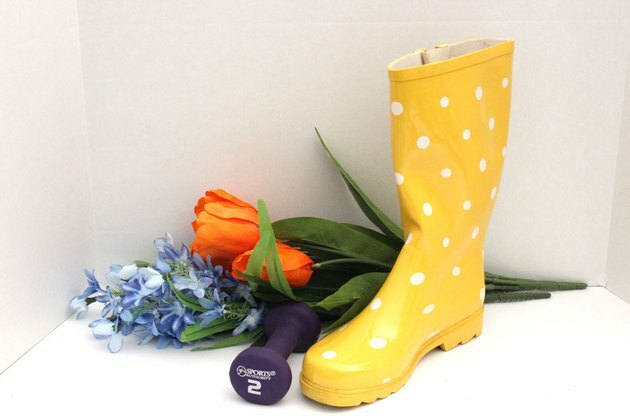 When the rainy season is over, what will you do with your rain boots? Instead of letting them hog up space in the closet, give them new life as containers for silk flowers. 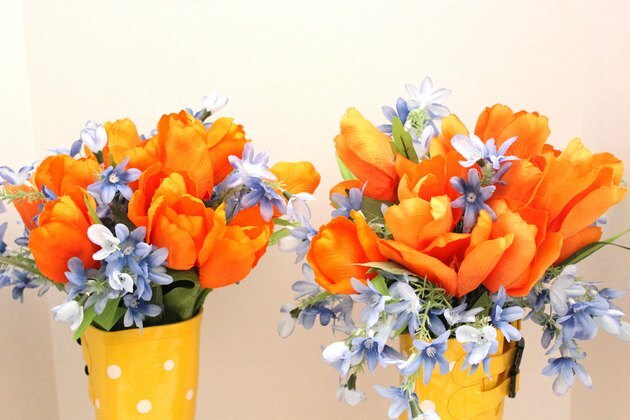 What a cheery floral arrangement you can make for your front porch or entryway. And if you don't already own a pair of boots, this project just might make you head to the shoe store. 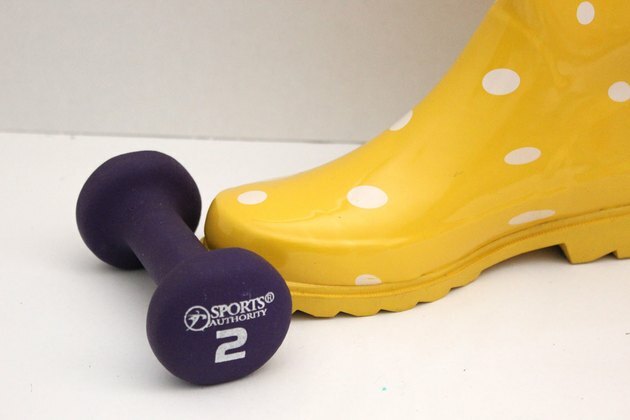 After a season of splashing through puddles, you'll want to give your rain boots a good cleaning with some soap and water or some spray cleaner. 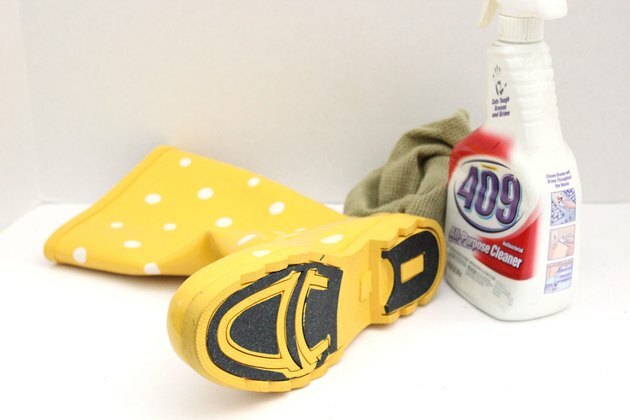 Be sure to give the soles a good scrubbing too if you're planning on setting them down on an entryway table or mantel. 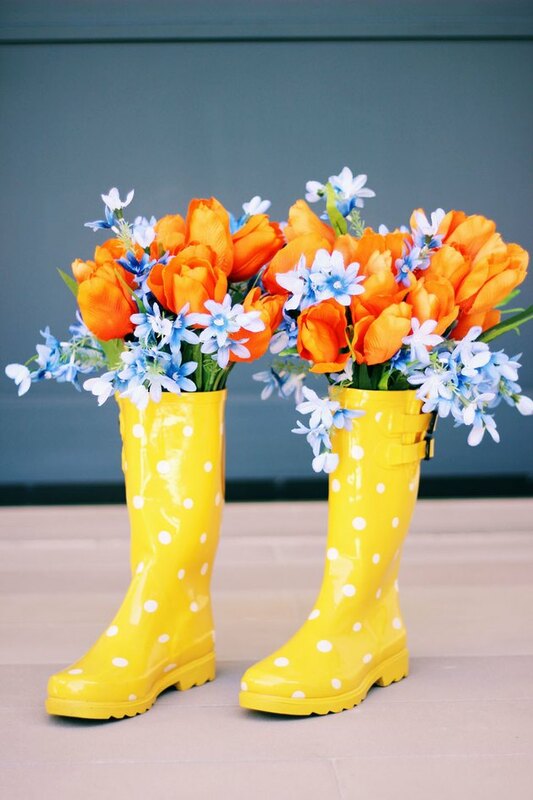 When you put flowers in the boots, they will become top heavy and may tip over, especially if they are going on a front porch where it's windy. To help stabilize them, place small weights inside the boot. 2-pound dumbbells are perfect for this purpose. Tall rubber boots tend to get saggy and do not always keep their shape. Create some support for them with some simple makeshift boot trees. Cut a piece of poster board so it is shorter than the height of your boots. Then roll it up into a cylindrical shape and tuck it into the boot. The poster board will push out against the rubber boot walls and give them a nice shape. 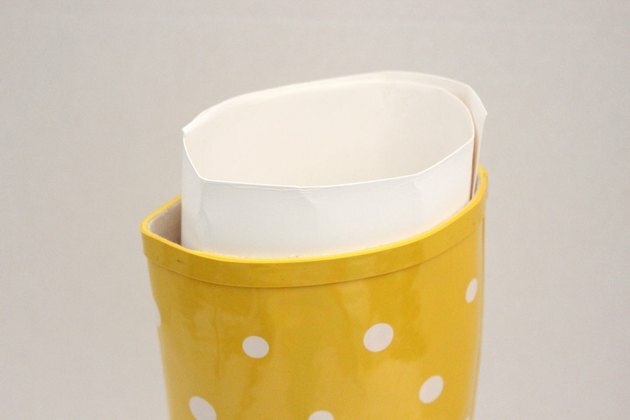 Tape the ends of the poster board to lock them in place. This is how the inside of the boot will look with the weight at the bottom and the poster board around the sides. 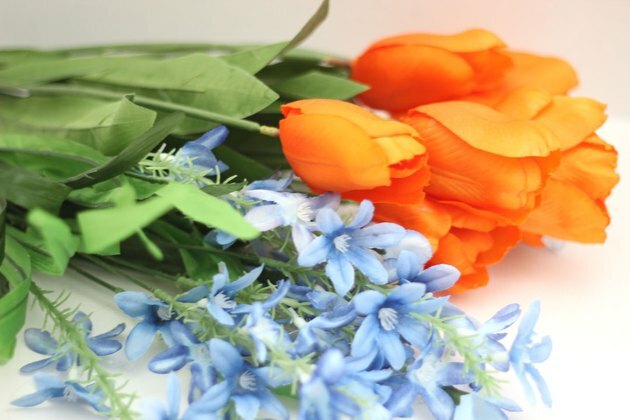 Decide on what kinds of flowers and which colors you'll use for your arrangement. If you can, take one of your boots to the store where you're buying the flowers so you can see which colors coordinate the best. I recommend making it simple by selecting only two types of flowers. One flower should be your main bloom and dominant color, and the other one a complementary variety. 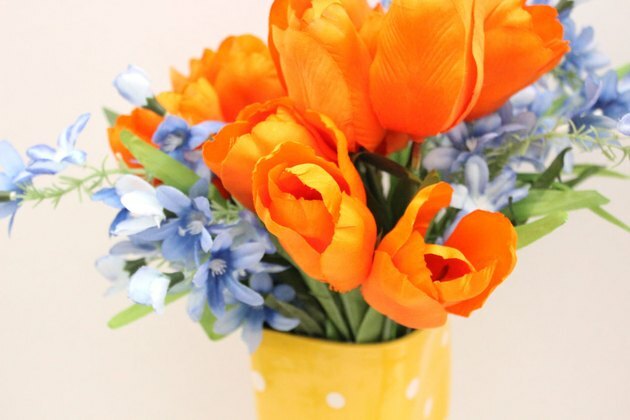 In this example, I chose orange tulips, which have a rigid structure, and paired them with smaller wispy blue flowers. The contrast of shapes and colors creates more visual balance. 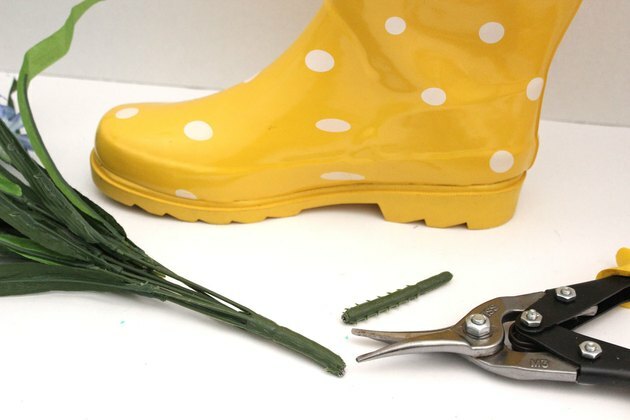 Using wire cutters, trim the stems of the flowers so that the blooms will fall just above the rim of the boots. We don't want too much of the stems showing. 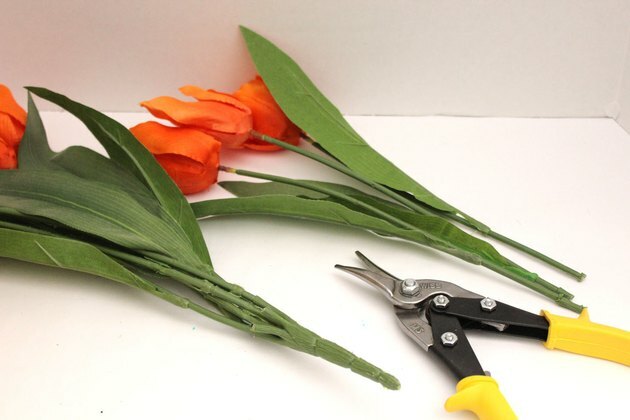 You will also want to cut a few individual stems of flowers from your stalks so that you can have more flexibility on where you place the blooms. Start by placing your complementary flowers( i.e. not your main blooms) in the boot. These are the accent flowers and the "background" of your arrangement. Then rrange the main flowers in the boot, scattering them between the other flowers. Adjust the flowers until the placement is good with you. 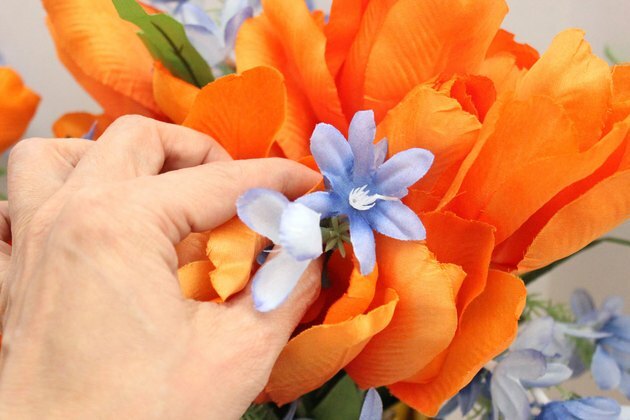 As with fresh flowers, you may want to cut off any blooms that seem out of place. 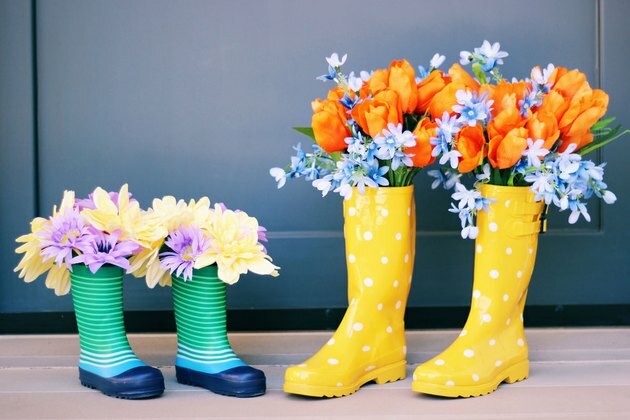 Place the boots side by side to make sure the flowers in each are the same height, and that there are about the same amount in both of them. Make adjustments as necessary. But don't stop with rain boots! You can also make arrangements with cowboy boots, high tops, army boots — and the list goes on. There's a decorative floral boot for every walk of life.